Life is making us abandon established stereotypes and outdated views; it is making us discard illusions. Mitterrand has 100 lovers. One has AIDS, but he doesn’t know which one. Bush has 100 bodyguards. One is a terrorist, but he doesn’t know which one. 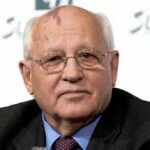 Gorbachev has 100 economic advisers. One is smart, but he doesn’t know which one. If the Russian word ‘perestroika’ has easily entered the international lexicon, it is due to more than just interest in what is going on in the Soviet Union. Now the whole world needs restructuring; that is, progressive development, a fundamental change. Some comrades apparently find it hard to understand that democracy is just a slogan.